The Eight of Pentacles is the eighth card in the suit of Pentacles. A positive card, you should expect good things to happen when you see it; especially aspects relating to a creative industry, or a project or part of your life that you have worked extremely hard on and dedicated yourself to. A good card to draw if you are intent on learning a skill or trade which you have a lot of passion for. The Eight of Pentacles represents hard work, determination and perseverance. Past – The Eight of Pentacles in the Past position can represent a path you are currently on, which you’re putting effort into. You might need to think clearly, or maybe it will be obvious. What are you truly exerting yourself on? Are you really putting in the hours at work, are you extremely dedicated to your family or partner? Be aware that this dedication will pay off in future. it can also represent an ambition or hobby you had as a child, which you were extremely dedicated to. If you’re looking for inspiration, childhood is always a good place to find it. Present – The Eight of Pentacles in the present position has a mixed meaning. Here, the Eight of Pentacles represents a future path you could choose. Do you want to put the effort in and be rewarded? You might have a much easier option available to you. Don’t treat it is ‘it’s easy so it must be the wrong choice’. Instead, carefully weigh up the options. if you have a passion, now might be the time to throw caution to the wind and embrace it as a larger part of your life. Future – The Eight of Pentacles in the future position suggests a successful career or creation of something great and positive. For example, you may create something that will change how people live for the better, or a new way of doing something that eliminates all the negative consequences. This is a great sign if you’re already working on something similar sounding. If you aren’t, then definitely look into how what you do currently can help others. Work / Education – The Eight of Pentacles in regards to work or education means a continued success and growth. Expect promotions and a developing, more advanced workload. If you work with others, you may go into a leadership position. As said, be sure to follow your passions and your own goals, not what others expect of you. Romance – The Eight of Pentacles in romance is a very good sign. A current relationship will greatly deepen; not through any event, but through continued understanding and shared experience. If you’re single and looking, you may have to work hard to understand why you are single, and what you really want. Working on yourself whether you are single or in a relationship is always good aim; look after your body and mind. Friends – The Eight of Pentacles in regards to friendship means things are going well. Don’t expect any arguments or gossip now or in the near future. It might be a good time to get into some deep conversations with your friends and get to know them better, or help them out with something that they need assistance on. Money – The Eight of Pentacles in regards to finances is another good sign. Don’t expect to come into some money, but do expect to see increased savings through cutting out what you don’t need, or finding better deals on things you already buy. Continue working as you are, and don’t even consider money a worry right now. Health – The Eight of Pentacles is mixed when placed for health. it isn’t a bad sign if you’re in ill health. Expect a long recovery, however. What’s really important is that you may really need to consider a lifestyle change. Stop going for the easy option in this aspect and put some effort in to treat yourself better. The only excuse for not eating well and taking care of yourself is laziness. Now might be a good time to start and stick to a diet or exercise regime. If you are considering something new like vegetarianism or veganism, it might be worth jumping in and dedicating yourself to it. Spirituality and Mentality – The Eight of Pentacles in spirituality means that now might be a good time to consider the future in general, and how you are going to play your part. It’s time to think about the deep questions; why am I here? What can I do with my time on Earth? Spirituality should be something you build upon throughout your life. Hard work and dedication reverses along with the orientation of the card; you may have been feeling especially uninspired and unmotivated recently, or you may have been working so hard that you have lost sight of what is truly important in life. 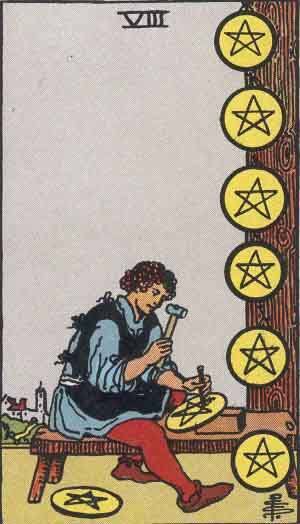 The Eight of Pentacles in reverse highlights the negative aspects of dedication and working. Are you working on what you want to work on?Are you truly satisfied in life, or are you just covering up your pain with toil, assuming things will get better if you only just put more effort in? Hard work is the best way to get somewhere in life, but you have to be working in the right direction. Eight represents energy and forward momentum. A strong number, it will guarantee success. The Eight of Pentacles in numerology is a sign that you were right to dedicate yourself a while ago, because it’s all about to pay off. The work you put in will be worth it, you will get a larger return on your investment, be it monetary or emotional. Many eights in a reading suggest a strong, positive change in your life. We’ve selected live tarot readers to give you a FREE 3 Minute interpretation of The Eight of Pentacles! Scroll through them below and pick your favorite one.